Hippodrome Online Casino 2019 - £1000 In FREE Bonuses! Visit Hippodrome Get Your Bonus! 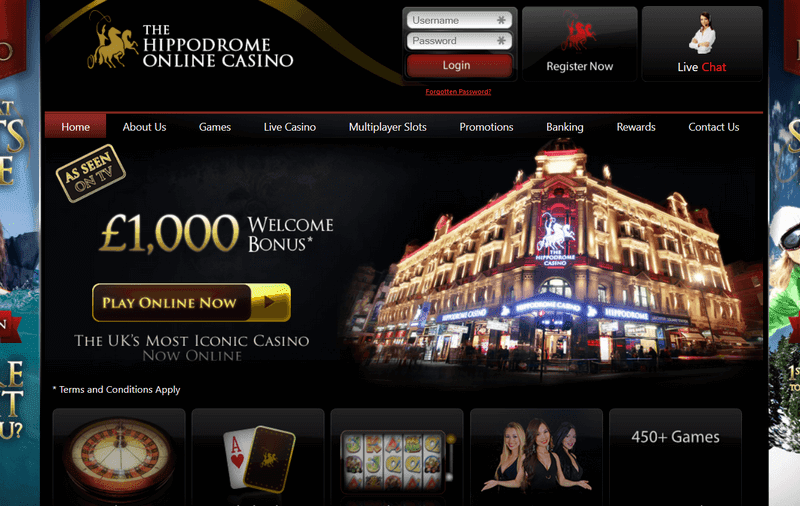 Hippodrome Online Casino Review was established in 2013. Fully licensed and regulated in the UK. Licensed by the Gambling Commission and outside of the UK by the Malta Gaming Authority. Reliable, secure withdrawals processed within 24 hours to a few working days. ? All legitimate, real-money poker sites like Hippodrome have strict anti-fraud screens, and that may create a short withdrawal delay. Accepts major credit cards and e-wallets for fast deposits. 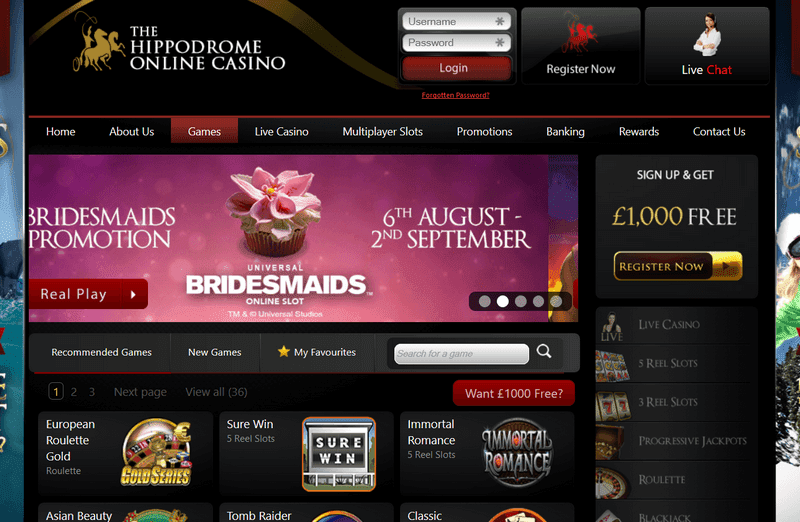 Hippodrome Online Casino matches your first 3 deposits up to £1,000. Third deposit: 50% up to £500! ? Please read the terms and conditions carefully and make sure to take full advantage of the bonus offer. With its elegant and sleet dark exterior, the Hippodrome Online Casino website complements perfectly the sophistication of its prestigious land-based counterpart. Since its founding in over a century ago in 1900, the Hippodrome has been London&apos;s premier gambling venue, and has recently been named the Best Casino Operator in Europe of 2015. It&apos;s no surprise therefore that the online version of this casino provides an equally high level of quality entertainment with over 450 real money casino games instantly available for real play to all registered members. The Hippodrome Online Casino offer players in the UK and around the world the chance to play their favourite casino games 24/7 from the comfort of their home or on their smartphone. Unfortunately, players in the US are not allowed and other geographical restrictions may apply. Registered and licensed in the UK and Malta, the Hippodrome gives web and mobile casino players a safe and fun way to win great rewards every time they play. In fact, new players can benefit from a £1,000 Welcome Bonus when they sign up and once they&apos;re logged in they can amass Loyalty Points that unlock even more desirable rewards. Hippodrome Online Casino is available for instant play on the web, and mobile players can take their favourite real cash slots game for a spin or indulge in a quick poker hand on their smartphone by downloading the Hippodrome Mobile Casino app on their Android or Apple devices. The mobile version features 55+ real money casino games, all rendered in beautiful detail for a truly immersive experience that will keep you hooked game after game. You don&apos;t need to wander about a loud and crowded casino lobby to find a free seat at your favourite game. Just log in to your Hippodrome Online Casino and access the games section, where you have a selection of all the game types you&apos;d find at any reputable land casino available with a click. There are over 450 real cash games in Hippodrome&apos;s online library, ranging from three to five-reel slots, progressives, roulette, blackjack, baccarat, video poker and other table games. All the real money casino games on Hippodrome are powered by world-class software provider Microgaming, famed for its progressive slots and attention to detail in creating software that truly replicate the feel of real casino games online. Players can expect to be treated to stunning visuals, authentic sound effects, and a silky-smooth, responsive gaming experience each time they play a new title on their computer or smartphone. New and experienced players will both feel at home at Hippodrome and are guaranteed to find a game that suits their tastes and bankrolls from the hundreds of real money titles available. The live casino games are a welcome addition to the mix and we tackle those later in this review. Hippodrome Online Casino take pride in offering banking options that are “safe, secure ad easy”. They offer a variety of payment methods which allow players to deposit and withdraw money quickly and easily. All transaction methods are digitally protected using SSL encryption technology, giving Hippodrome Online Casino players complete peace of mind when moving money to or from their accounts. Hippodrome Online Casino rewards every player that signs up for a new account with a generous £/$/€ 1,000 Welcome Bonus Package to start off their experience feeling like London glitterati. The Welcome Bonus package is structured as three match bonuses offered on your first three deposits. 1st Deposit Bonus - Hippodrome instantly doubles your first deposit up to £250, so you can check out the vast collection of slots or table games straight away. 2nd Deposit Bonus - Your second deposit will be matched by 25% up to £250, buoying your bankroll further and giving you a chance to earn bigger prizes when placing your stake. 3rd Deposit Bonus - Earn up to £500 FREE when you make your third deposit thanks to a lucrative 50% match bonus. To qualify for the Welcome Bonus, new players must check the box “I wish to receive Welcome Bonus 1, 2 and 3” when registering for an account. Welcome Bonuses must be claimed within a week from signing up for the offer to be valid. Each Welcome Bonus has a 50x wagering requirement before it can be withdrawn from your bankroll. The Hippodrome Online Casino runs its own Rewards Club where members can earn 5 Loyalty Points for every £10 wagered on the website or when playing on the mobile app. Earning Loyalty Points allows players to move up the six Loyalty Levels of the Rewards Club. Every player starts at the lowest-tier, Red, and can ascend up to Privé, unlocking more bonuses and richer rewards along the way. All loyalty points are automatically credited to the bonus account and once you have accumulated at least 5,000 Loyalty Points you can redeem them in free casino credits. It&apos;s worth pointing out that different game groups contribute different percentages of the wagered amount that is returned as Loyalty Points, and that Loyalty Points expire after 90 days from the date they are added to your bonus account. Besides the terrific variety of online slots Hippodrome has on its website and apps, players can also try their hand at something familiar yet completely different from their usual 5-reel gambling exploits. Hippodrome Online Casino has three real cash multiplayer slots titles which you can play alongside five other players. Each player gets to play on separate reels, however they also share some bonuses in common, such as free spins, which are automatically awarded to all active players when triggered by anyone during play. The selection of multiplayer slots is currently very restricted: players can play classic titles like Avalon, or try their luck at Wheel of Wealth, or No Worries. If you can&apos;t make the trip to London to play at the real Hippodrome Casino, you can benefit from the close second best experience online by connecting via webcam with one of their live dealers. Four gorgeous dealers expertly deal out the cards or manage the chips in a real casino lobby, giving you the chance to experience all the glamour of land-based casino with the convenience of online play. Hippodrome Online Casino lets you play live Hold&apos;em, Baccarat, Multiplayer Blackjack, and Roulette. Play for real cash against the dealer or with players from around the world in real-time. With such a renowned casino name, the Hippodrome had to match the quality of its mobile app to the reputation of its brick-and-mortar counterpart. Hippodrome casino offers two apps: one for Android devices, and one for iPhone devices that is available on iTunes, each featuring close to 60 intricately visualized, highly realistic games you have only dreamed about until now. The design is darkly alluring and the software responds to every little touch. Both the website and the mobile version accept most methods of online payment that are currently in use, such as Visa, Neteller, Paysafecard, ClickandBuy. Payment is made easy, completed in just a few clicks. And if you are not ready to pay just yet, you can try out the Demo Play which exists for nearly all the games. If you run across any trouble, the 24/7 customer service will immediately help you get back to playing right away through the live chat support. A casino with a well-known name with UK online casino players, Hippodrome offers a superb collection of games that will raise the spirits of even the pickiest and most disenchanted of experienced players. There are multiplayer slots, live-dealer games and video poker on top of all the traditional slots and table games, and the mobile app performs high on all scales. The loyalty program is multi-layered and it can provide you with a many offers, bonuses, extra points, and real cash to keep your bankroll healthy and you playing. When you add to all of this the fact that Hippodrome online casino is certified by eCogra for fairness and reliability, you know that you have a responsible casino that will take good care of you and your money. Join Hippodrome Online Casino today and claim up to £1,000 bonus on your first three deposits!